Excellent Post, especially for someone such as I who never thought about all these complexities introduced by clouds. Any feelings about how much uncertainty this introduces into future average Earth temperature projections? Experimental results are perhaps the best to go on. I was impressed by those Berkeley Earth results for temperature measurements going back into the 1800’s…..What does Science of Doom and others think of graphs such as the one accessed at: ? Curious: Before 1850, the standard method of putting a thermometer in a isolated shaded passively-ventilated enclosure was not used. This became standard practice in most locations between 1850 and 1900. When BEST goes back before 1850, they are entering a period without standard measurement practices and large correction factors. I wonder whether there methodology can properly align data with such serious problems. Whatever you believe, take their expanding confidence interval very seriously. I haven’t looked into the accuracy or uncertainty of the global temperature reconstructions. Because I know that different people with different approaches (including Berkeley who came to it as an outsider group) have looked at the data and appear to have almost identical reconstructions I assume that they are probably roughly correct. ..how much uncertainty this introduces into future average Earth temperature projections? Experimental results are perhaps the best to go on. Compared with? A model is a simplification. It wasn’t a revelation to me finding more details on this particular aspect of the simplification. What uncertainty into future average Earth temperature projections do sub-grid parameterizations introduce? My answer so far: “Quite a bit”. Perhaps too many significant figures in that answer, I don’t want to give an idea of super-accuracy.. Experimental results are perhaps the best to go on. Climate scientists are doing experiments all the time. One part of the blogosphere imagines that 99% of climate scientists sit around supercomputers, get the output and make pronouncements. (I’m not saying you think this, I just can’t resist the opportunity to mock the idea). The earth is a big place and measuring microphysics processes across all settings is extremely challenging. There have been lots of satellites in the last 15 years to give detailed measurements of a large number of variables (including aerosol parameters) across most of the globe often on a daily basis. This helps to uncover a lot of relationships. Then there are lots of field experiments to dig into various parameters. And then there are approaches of using higher resolution models on shorter time periods across a smaller region to get a better understanding of various relationships and to find and correct flaws in GCMs’ parameterizations. There is one massive experiment running at the moment, but we won’t get the results for some time. Well, we’re getting one result in about a week… February 2017 is going to have a really high anomaly. Exactly what one would expect on the way to a really warm year… maybe even the 4th warmest in a row. And, SSH as of Nov 30, 2016… a La Niña period… was at its highest level in the satellite record. OHC has backed off a bit, but it’s on its way back up. SOD: If you are getting back into models, this might make an interesting post. Ming Zhao, J.-C. Golaz, I. M. Held, V. Ramaswamy, S.-J. Lin, Y. Ming, P. Ginoux, B. Wyman, L. J. Donner, D. Paynter, and H. Guo, 2016: Uncertainty in Model Climate Sensitivity Traced to Representations of Cumulus Precipitation Microphysics. J. Climate, 29, 543–560. Uncertainty in equilibrium climate sensitivity impedes accurate climate projections. While the intermodel spread is known to arise primarily from differences in cloud feedback, the exact processes responsible for the spread remain unclear. To help identify some key sources of uncertainty, the authors use a developmental version of the next-generation Geophysical Fluid Dynamics Laboratory global climate model (GCM) to construct a tightly controlled set of GCMs where only the formulation of convective precipitation is changed. The different models provide simulation of present-day climatology of comparable quality compared to the model ensemble from phase 5 of CMIP (CMIP5). The authors demonstrate that model estimates of climate sensitivity can be strongly affected by the manner through which cumulus cloud condensate is converted into precipitation in a model’s convection parameterization, processes that are only crudely accounted for in GCMs. In particular, two commonly used methods for converting cumulus condensate into precipitation can lead to drastically different climate sensitivity, as estimated here with an atmosphere–land model by increasing sea surface temperatures uniformly and examining the response in the top-of-atmosphere energy balance. The effect can be quantified through a bulk convective detrainment efficiency, which measures the ability of cumulus convection to generate condensate per unit precipitation. The model differences, dominated by shortwave feedbacks, come from broad regimes ranging from large-scale ascent to subsidence regions. Given current uncertainties in representing convective precipitation microphysics and the current inability to find a clear observational constraint that favors one version of the authors’ model over the others, the implications of this ability to engineer climate sensitivity need to be considered when estimating the uncertainty in climate projections. A very interesting paper, worth another article along with some other papers they cite in the family. Although this study suggests that the response of convective detrainment (or precipitation) efficiency to global warming may be important for understanding GCM-simulated cloud feedback uncertainties, it is beyond the goal of the present paper to answer how convective precipitation may change in a warmer climate. Many processes can affect the convective precipitation efficiency, including cumulus mixing dynamics, the formation and evolution of cloud and precipitating hydrometeors [climate word for rain and snow], the fall of precipitation and associated downdrafts, and precipitation reevaporation, as well as convection organization and its interactions with radiation and circulation. High-resolution cloud-resolving simulations of radiative–convective equilibrium (RCE) suggest that convection is more likely to aggregate in a warmer climate (e.g., Emanuel et al. 2013). This suggests a possible increase in precipitation efficiency with warming. However, model simulations of convective aggregation in RCE are sensitive to many details, including domain size, resolutions, and initial conditions (e.g., Bretherton et al. 2005; Muller and Held 2012). Coupled with our limited understanding of the relevance of RCE for more realistic atmosphere, the relevance of this result for climate sensitivity remains unclear. Once aggregated, the organized convection tends to dramatically reduce the domain-averaged relative humidity and clouds throughout the troposphere, indicating strong reductions in the magnitude of both LW and SW CRE (e.g., Bony et al. 2015; Tobin et al. 2012). It is, however, not obvious how the net CRE might change because of the cancellation between LW and SW components, especially considering the poor simulation of thin cirrus clouds in current GCMs, which could have a large impact on LW CRE. Recently, Mauritsen and Stevens (2015) hypothesized that a possible increase in convection aggregation in warmer climates might lead to the iris effect of Lindzen et al. (2001), which could be missing in GCMs and may cause the high climate sensitivity and muted hydrological change in GCMs. However, changes in precipitation efficiency in our model do not appear to manifest themselves as a significant iris-like effect. As shown in Figs. 4–6, the models produce a much smaller difference in the response of high clouds and LW CRE than the response of low-plus-middle clouds and SW CRE. At this time, it is not clear to what extent the iris effect due to changes in precipitation efficiency might be model dependent, but there is an indication that this might be the case. As pointed out by Mauritsen and Stevens (2015), when their formulation [Eq. (1) in Mauritsen and Stevens (2015)] for parameterizing convective precipitation efficiency is used in the NCAR climate model, it produces an increase in equilibrium climate sensitivity opposite to the decrease seen in the ECHAM6 model. Future research would be needed to understand the cause of these discrepancies. Ever increasing model resolution along with process studies may finally bring these questions to a conclusion. Somewhere between the end of this decade and the time when supercomputing power has increased by a factor of a trillion or so. You know when you are there (actually a little after: because the results stop changing; the process studies back up the formulas; and the empirical results match the model simulations), but not before. Sometime I will try and write an article to illuminate the issue to people who can’t picture how models, model resolution and parameterizations create a fog of confusion..
Obviously Nature and Science think these papers are high quality (they are very discriminating journals). SOD: Thanks for the linked papers. The differences between models of a simple aqua planet in Stevens and Bony shows just how “wrong” most models must be – because at most one of these four is right. When feeling sarcastic, I’d say that the greatest climate change catastrophe since the last ice age was the desertification of the Sahara. I’d believe predictions of future catastrophe only when GCMs were able to explain this part of the past. The Bony Nature paper takes this problem seriously. I’ve become obsessed (often a bad idea) with the idea that simple physics links climate sensitivity to a slow down in convective turnover of the atmosphere. An ECS of 3.7 K/doubling implies an increase in net TOA flux of only 1 W/m2/K. At constant relative humidity, latent heat transport at the surface (80 W/m2) increases at 7%/K or 5.6 W/m2K. IF that 5.6 W/m2/K increase in latent heat continues to be transported to the upper troposphere (where it can escape to space as LWR), then incoming SWR must increase by 4.6 W/m2/K. Since current albedo reflects about 100 W/m2 of incoming SWR, this would require an unrealistic 4.6%/K decrease in reflected SWR. Net radiative cooling of surface (OLR-DLR) does not change appreciably with surface temperature. So, for climate sensitivity to be high, this 7%/K increase in absolute humidity near the surface can not be carried upward at the current rate of atmospheric turnover. This provides an alternative to the standard way of approaching climate sensitivity, summing Planck, water vapor, lapse rate, cloud and surface albedo feedbacks (in terms of W/m2/K). An ECS of 3.7 K/doubling implies an increase in net TOA flux of only 1 W/m2/K. Assuming ECS means equilibrium climate sensitivity, net TOA flux at equilibrium would be zero, not one W/m². If you mean the instantaneous flux change for a step doubling of CO2, the net TOA flux would decrease, not increase. It doesn’t. The scale height of water vapor is 2km. 99.3% of all water vapor in the atmosphere is below 10km. Most latent heat is transferred to the atmosphere in the first 4km. Except in large storms, there is little latent heat transfer above the middle of the troposphere. Increasing precipitation with temperature means that the surface temperature doesn’t go up as fast, i.e. lower ECS, because you have latent heat transfer replacing radiative heat transfer to keep the energy balance. Precipitation is not an independent variable. To put it another way: If you have an ECS of 3.7K/doubling, then you can’t have precipitation increasing at 7%/K. That sort of increase would mean an ECS well below 2K/doubling. The 4 papers provide some interesting contrasts, probably worth an article. Which is quite a different perspective from Mauritzen. They [Sherwood et al 2014] suggest that a model with stronger present-day mixing strength, as measured by their index of subgrid-scale mixing S and an index of large-scale mixing D [see Sherwood et al. (2014) for the definitions of S and D], tends to produce more positive cloud feedback and therefore a higher sensitivity. We have made the same calculation of these indices from H, M, and L and found no evidence that these indices explain the model differences described here. In particular, we found S to be systematically larger in the lower-sensitivity models M and L than in H.
SOD, I would interject a note of caution concerning increasing spatial resolution in turbulent simulations. The cultural prejudice among modelers is that if we could only run a fine enough grid and had a big enough computer we would resolve “all scales” and get the “right” answer. There is some recent evidence of a disturbing lack of grid convergence in LES simulations of turbulent flows. There is still a lot of very hard work to do before we get a handle on these issues. Also bear in mind that convection is a classical ill posed problem due to the turbulent shear layers. It’s of course an interesting area for people to work on, but also quite challenging. I thought I would point out that Nic Lewis has a summary writeup on ECS that includes in its later parts what I found some interesting points on convection in GCM’s and also on clouds. Sorry for my slow reply, I have been travelling. I had a read of Nic Lewis’ article, very interesting. The cultural prejudice among modelers is that if we could only run a fine enough grid and had a big enough computer we would resolve “all scales” and get the “right” answer. There is some recent evidence of a disturbing lack of grid convergence in LES simulations of turbulent flows. There is still a lot of very hard work to do before we get a handle on these issues. There is a big difference between Large Eddy Simulation (LES) – which still contains some important parameterizations for closure of the equations – and Direct Numerical Simulation (DNS). So do modelers believe getting to LES would get the right answer, or we need to get to DNS? If we could do DNS then the answers would still depend on initial conditions and selection of material properties and perhaps we would be no further along due to having to run 1 trillion ensembles of initial conditions.. (I don’t know the answer). And perhaps we would still have convergence issues? SOD, I thought I made a comment last night but it seems to have disappeared for some reason. In any case, the problem here is that LES and DNS are an area of deep ignorance. The simulations are too expensive to do real validation studies. In any case, theoretical understanding is lacking. High quality data is lacking too. The real issue for all these eddy resolving simulations is the nature of the attractor. Next to nothing is known. Rigorous bounds on attractor dimension are huge — O(Reynolds#). How attractive is the attractor? Critical question for numerical simulations. We know nothing really. What does “convergence”mean in a time dependent context? We know next to nothing. We do know there will be bifurcations and saddle points where the “climate” of the system will be very sensitive to initial conditions. In terms of evaluating discrete simulations, one really serious problem here is that standard error control methods fail for time accurate chaotic simulations because the adjoint diverges. Just chopping the time step and seeing that the changes are not too large is not adequate. So in a state of ignorance, people tend to fall back on cultural prejudice or scientific arrogance or colorful fluid dynamics. It’s very dangerous. The problem here is that the computational resources demanded by this faith based approach are huge. In the absence of better understanding, that may be a huge waste of resources. Just throwing darts at a picture of James Hansen with a halo, who was one of the originators of the dubious idea that if I run a weather model for centuries on a very course grid, the answers mean something. For climate simulations, these methods will be impossible for your and my lifetime and possibly forever depending on the nature of the attractor. You are digging into some of the technical details of subgrid parameterizations of ill posed processes such as convection and precipitation. I personally think there is an opportunity to use simpler models to help us understand the nature of the problem and establish parameters for further research. And we need to improve our theoretical understanding of the Navier-Stokes equations. There are promising theoretical ideas here. Instead, we are wasting billions on research projects that just “run the models” and then draw dubious conclusions. The climate science establishment is all in on this self-serving research plan. An excellent example of how colorful fluid dynamics can be used to serve political interests is Gavin Schmidt’s most recent post at Real Climate. AOGCM’s are used along with fingerprinting to “prove” that recent warming is almost all due to CO2 increases. But, AOGCM’s get the detailed patterns wrong, including SST warming patterns, TMT, topical TMT, and indeed GMAT too if you focus on the last few years. How the fingerprints are supposed to be meaningful is beyond my comprehension. Schmidt insists that AOGCM’s are not tuned to GMAT even though it seems to be rather good for the historical period in CMIP5 runs. I don’t believe that modelers just ignore this historical record. You can see in Nic’s writeup on ECS what some of the serious problems are. Basically, by changing parameters controlling precipitation and clouds, you can get a wide range of ECS and SST patterns. No one has offered a convincing argument as to why AOGCM’s offer meaningful scientific evidence of much. Instead, we are wasting billions on research projects that just “run the models” and then draw dubious conclusions. The climate science establishment is all in on this self-serving research plan. Even worse, most of the models are minor variations of the same basic model. I believe the word ‘mathturbation’ applies. The question of evaporation & precipitation in a warming climate is also worth a separate article. At the moment I don’t understand it. That is, there is a constraint or two that I am not understanding when I read papers talking about it. Thanks for a thoughtful exposition, as well as the links. I am encouraged that there is at least some acknowledgement in the papers of 1) a lack of progress by the models in reducing uncertainty in climate sensitivity, 2) that empirical estimates of sensitivity generally fall well below the model average, and 3) that it is crucially important for developing sensible public policy to accurately quantify the value for climate sensitivity. My personal guess is that empirical estimates will lead the way in narrowing the plausible range for sensitivity (just as they have so far), especially if uncertainty in aerosol effects (direct and indirect) can be modestly narrowed. Models, if substantially improved, are more likely to contribute to estimating how precipitation will change, both globally and regionally. SOD, Thank you for writing this very good post. I have two comments. 1. You quote Golaz et al 2013 “Cloud tuning in a coupled climate model: Impact on 20th century warming”, as citing Andrews et al 2012 as well as Kiehl et al 2007 and Schwarz et al 2007 as showing that global climate models exhibited inverse correlation between forcing and sensitivity. The relevant forcing by far here is aerosol forcing. The absolute level of forcing from CO2 matters little since the ratio of CO2 concentration to preindustrial will be the same for all models for equilibrium climate sensitivity (being 2x) and for their historical simulations. While Kiehl showed a significant negative correlation between aerosol forcing and sensitivity in CMIP3 models, little such correlation exists in CMIP5 models. Andrews et al 2012 did not in fact look into the ECS – aerosol forcing correlation, but Forster et al 2013 JGR did, and found it far weaker than in CMIP3 models. The explanation of the weak (negative) correlation between aerosol forcing and ECS in CMIP5 models is that they exhibit a very large spread in warming over the historical period. Models with low aerosol forcing (primarily, those with no indirect aerosol effect) generally warm faster than observed. The main exceptions are the inmcm4 model, which has the lowest ECS of all CMIP5 models (about 1.9 K), and the two GFDL-ESM2 models, which have very low TCR to ECS ratios. 2. Thank you for drawing attention to the Siefert et al paper. Its finding that aerosol indirect forcing is probably minor, and much weaker than simulated by GCMs that include it, is consistent with the beliefs of Graeme Stephens, who has very extensive knowledge of clouds, particularly from the observational side. He has said that he would recommend incorporating no indirect aerosol forcing in it. That is what Siefert’s co-author Bjorn Stevens, another great cloud expert, did in the MPI CMIP5 models. A consequence of indirect aerosol forcing being zero would be that to match historical warming a GCM would need to have a very low TCR – of the order of 1.2 K, if other AR5 forcing data are realistic. This information is inconsistent with Figure 10.5 of AR5 WG1, which shows that high warming from GHGs must be offset by high cooling from aerosols. There is no other way to get much tight error bars for total anthropogenic warming than for either of its components. In Table 3 of Forster (2013), I find that there is a fair correlation (R2 0.32) between Hist GHG 2003 (warming caused by GHGs) and Hist NonGHG 2003 (net cooling caused by nonGHGs = aerosols, land use, O3). This agrees with what one would expect from Figure 10.5. Nevertheless, Forster’s Figure 9 shows no correlation between the amount of warming produced by a model and its climate feedback parameter (alpha), its ocean heat uptake efficiency (kappa) or the sum of these two, climate resistance (rho). How can this be? I think these values have been obtained from 4XCO2 experiments. If I understand correctly, many models do not behave as if these parameters are constant with time or the same in TCR and 4XCO2 runs. Historical warming is most closely related to the 1% pa model runs used to calculate TCR. I’d guess that if one knew alpha, kappa and rho for TCR runs, we’d probably see a relationship between aerosol cooling and rho. If I look at the adjusted forcing (ie W/m2, instead of K) through 2003 from GHGs and from nonGHGs, there is almost no correlation. So the correlation appears only with warming (forcing times TCR). With all of the different kinds of forcing and imperfections with mathematic models of GCM output, I don’t really understand this stuff very well. Nor can I explain why there is so much scatter in 2003 warming in the GRL paper 1.0 K (0.4-1.5 K, 90% ci) and less scatter in Figure 10.5, 0.7 K (0.6-0.8 K, 70% ci). The difference in warming is because Figure 10.5 covers 1951-2000, while the GRL paper covers the historical period (1860-2003). Then we have the added complication that the GRL paper doesn’t clearly separate aerosol cooling from other nonGHG factors (land use and ozone) and Figure 10.5 doesn’t tell us where land use and ozone enter the picture. 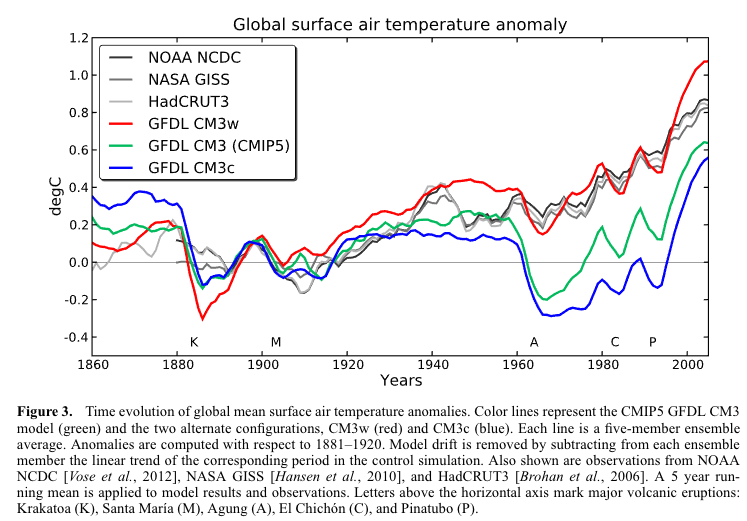 The GFDL CM3 model showed only 0.3 K of warming since 1860 in the GRL paper. I wonder how much warming it showed from 1951-2000? Could it have been discarded as an outlier? Figure 10.5 | Assessed likely ranges (whiskers) and their mid-points (bars) for attributable warming trends over the 1951–2010 period due to well-mixed greenhouse gases, other anthropogenic forcings (OA), natural forcings (NAT), combined anthropogenic forcings (ANT) and internal variability. A quick response as I am about to go out. I don’t think that’s right. Fig. 10.5 is based on spatiotemporal pattern regression. It is much easier to separate responses to natural forcings (which are cyclical or episodic) from those to anthropogenic forcings than to separate responses to GHG forcing from responses to non-GHG anthropogenic forcings, all of which have magnitude time series that are nearly colinear with those for GHG forcing. Nic replied: I don’t think that’s right. Fig. 10.5 is based on spatiotemporal pattern regression. Thanks Nic. I see that Figure 10.5 (which is derived from 10.4) uses “fingerprinting” from model output to attribute OBSERVED warming into GHG and non-GHG components and the error bars may reflect the uncertainty inherent in this attribution. I thought this Figure summarized how models hindcast similar amounts of total warming from very different amounts of GHG warming and aerosol cooling. So this output conveys almost the same message as Figure 10.5 except – as you pointed out – the error bar for all modeled warming – is far wider than for ANT. So there is far less evidence supporting tuning than I thought, though – as I noted above – there is still a modest negative correlation between HistGHG and HistNonGHG. Models HINDCAST 1.12 (0.88-1.64) K warming due to WMGHGs only but ATTRIBUTE only 0.9 (0.5-1.3) K of observed warming to WMGHGs through fingerprinting. (:)) No wonder I am confused. I’m travelling and left my notes behind.. I did start to look at the direct aerosol forcing from a number of estimates and there was quite a range. It led me to think that even with zero indirect aerosol forcing, climate sensitivity would still be quite varied across models. However, I hadn’t got too far with a review. To clarify, this comment of mine was based on assuming that forcings in the GCM matched best estimates per AR5, save for indirect aerosol forcing being zero. Obviously, if a GCM had very strong direct aerosol forcing, or unrealsitically low GHG forcing, it would be able to match historical warming with a higher TCR. Fig. 7.19(b) of IPCC AR5 WG1 shows the uncertainty in direct aerosol forcing (RFari) estiamted for CMIP5 models. The median is ~ -0.45 W/m2; the 17th percentile is ~ -0.6 W/m2. Models without indirect aerosol effect warmed 0.2 K (0.05 K/decade) more than models with indirect aerosol effect. This gap developed between 1940 and 1980: 0.34 K vs 0.14 K of warming in the multi-model mean in this period. Models without indirect aerosol effect show warming 0-0.05 K/decade of warming during 1940-1979 almost everywhere except polar regions. Models with aerosol indirect effect show cooling of 0 to -.05 K/decade on all continents and most NH temperate oceans, with some regions cooling -0.05 to -0.10 K/decade. Unfortunately this period begins with the suspect SSTs during WWII and includes most of the full amplitude of the fall in AMO (0.25? K), which climate models presumably don’t replicate. So, with the indirect aerosol effect and cancelled AMO, models might predict a fall of -0.1 K and without a rise of +0.1 K – along with large land/ocean and NH/SH differences. (And these hindcasts might be biased high if the average model has a climate sensitivity that is too high). The observations don’t conclusively favor either type of model. The spatial pattern of temperature change over this period might be more informative, but the authors (suspiciously?) didn’t provide a spatial pattern for observed warming during 1940-1979. The complications from the AMO might be eliminated by studying 65-year periods from trough to trough (1915-1980?) and/or peak to peak (1940-2005?) that include the period of biggest change in indirect aerosol forcing (1940-1980). In case you have forgotten, Isaac Held had an interesting post and video on resolving ocean eddies that covered some basic principles about scale. As for initialization, my guess is that we don’t need an ensemble with a trillion runs. The rational? Imagine picking different starting years in the instrumental record as a model for picking different initialization conditions. When energy balance models are used to calculate TCR over the past 130 or 65 years (Lewis and Curry 2014) or the past for 40 year and decades in the past 40 years (Otto 2013), we obtain roughly the same answer. IMO, the Pause in the first decade of the 2000s has lost its significance: the trend in the two decades before and after 1998 are essentially the same. So, if picking different starting years in history is a good model for different initializations of an AOGCM, I think we are likely to reach about the same average future in about 50 years (but not a decade or two). For a long-term perspective (more than a century), the instrumental period is too short. The combined ice core record from both poles during the Holocene (for a longer perspective) might be useful. Unfortunately, we don’t know how much of the variability in that record is naturally-forced, and how much is unforced variability (like ENSO and other phenomena we see in the instrumental record such as the AMO) and how much is forced. However, if we are on the verge of some chaotic bifurcation or tipping point my rationalization is meaningless. Descent into another ice age? Massive release of methane? We have experience catastrophic climate change during the Holocene – desertification of the Sahara. I think the questions are important. How do supercooled water droplets and ice particles increase or decrease in the atmosphere as the climate change, and what impact will it have on radiation. Will the atmosphere be optically thinner than models assume, and what do models assume? The research published today in Science by Storelvmo, her graduate student Ivy Tan, and Mark Zelinka of Lawrence Livermore National Laboratory (Tan et al, 2016) analyzes satellite measurements to conclude that the middle and upper troposphere contain a higher ratio of water to ice than was previously believed. The water is present in the form of super-cooled droplets; the ice, in tiny crystals. The ratio of water to ice is critical because tiny water droplets are highly reflective of incoming sunlight and ice crystals are not. A higher liquid fraction in the upper atmosphere means greater reflection of incoming solar radiation: less sunlight and heat reach the Earth’s surface and there is less warming. This is a classic example of negative feedback in the climate system: as the atmosphere starts to warm because of increased greenhouse gases, a mechanism sets in to dampen the effect—in this case, suspended ice crystals in the upper troposphere melt into tiny water droplets that reflect solar energy back into space. Current climate models correctly simulate this effect by replacing ice with water as the world warms, but these models appear to have overestimated the actual availability of ice. Less ice to melt means that less water will form to brighten the atmosphere. The latest findings by Storelvmo and her colleagues indicate that much of the incoming solar radiation that today’s models predict will be reflected back to space (as tropospheric ice converts to water) will actually pass through the atmosphere and heat the Earth. To calculate how much additional heating will occur, the authors configured the National Center for Atmospheric Research’s Community Atmosphere Model (CAM 5.1) to calculate equilibrium climate sensitivity using a range of atmospheric water-to-ice ratios based on the latest satellite estimations. The newly constrained model predicted an equilibrium climate sensitivity (ECS) of between 5.0 and 5.3 degrees, compared to an estimate of 4.0 degrees using the conventional water-to-ice ratio. Storelvmo expects that when other researchers adjust their respective models to reflect appropriate proportions of ice and water in mixed-phase clouds, all of their ECS values will shift upward. I suspect this to have a big acticvist fingerprint, as it cannot show the changes in ice crystals and water droplets over time. They cannot show satellite measurements, even when that should be the data they use. And there is some confusion in the presentations of the study. Some say thar ice particles don`t matter, and it is when the atmosphere heats and they turn into droplets that it has cosequences on incoming radiation. some say that the more ice you have in the upper atmosphere, the less warming there will be on the Earth’s surface. Something for SoD and other readers to get a sober glance at? And nothing about the real and historical change of supercooled liquids and particles in the atmosphere. Joel R. Norris,	Robert J. Allen,	Amato T. Evan,	Mark D. Zelinka,	Christopher W. O’Dell	& Stephen A. Klein. This should show another story than Tan et al. And Mark D. Zelinka on both of them. Speaking with two tongues? NK: Climate models are tuned to reproduce today’s climate. If the parameterization of clouds in an AOCGM needs to be modified so they contain less ice (and therefore have a smaller albedo), then other model parameters will need to be adjusted so that a final revised model will exhibit today’s albedo. Speculating about the output of a final revised model that properly represents ice in clouds AND today’s climate seems pretty worthless to me – but it will get you published in Science and praised by those convinced catastrophe is coming. (The same thing wouldn’t happen if these changes had lowered climate sensitivity.) Perhaps CMIP 6 models with modified clouds will exhibit ECSs of around 5.0! In that case, the difference between models and observations will be far greater than it is today and we will have conclusively proved that models are invalid! The same arguments apply to the slight change in albedo due to a poleward shift in storm tracks on warming. Cynicism and sarcasm aside, I suggest you look at the PNAS paper below, which compares cloud feedbacks during the annual seasonal temperature cycle. (One of the authors, Manabe, pioneered the GFDL climate model.) Due to the difference in heat capacity between the hemispheres, the average location in the NH warms about 10 K during its summer while the SH is cooling only 3 K. The resulting 3.5 K change in GMST is associated with large, feedbacks that have been observed many times in the satellite era. This paper shows how well current climate models are able to reproduce these feedbacks, especially cloud feedback. No models do a particularly good job reproducing today’s seasonal feedbacks AND they disagree significantly with each other. When we have some models that do a good job of reproducing what we observe from space (during the seasonal cycle and at other times), then I will worry more than I currently do about the possibility ECS is well above 2 K. Others may choose to respond to all of the ups and downs on what is likely to be a long scientific journey. Frank: Thank you for your replies. My point is that there is still so much uncertainty in basic parameterization of clouds (and ocean) that all models will necessarily be wrong. Each model will have a lot of parameters combined. So I cannot imagine how one can trust it when it comes to “projections” into a distant future. Or to trust an ensemble, with many of the biased parameters in common. I suspect them to be far to optimistic in this, when I look at the difficulties to measure scattering, absorption and emission from all the types of clouds, how clouds change over short periods, and to calculate feedbacks..
And thank you for the reference Frank. I think it shows how climate models are systematically biased when it comes to cloud radiative forcing, But I don`t know if it will help very much to get it right. Some precision of my latest comment. I think the working with gain factors can give some better hindcast, and some better predictions for the first decades. But to fix some weaknesses doesn`t mean that it will be right (as to have a long predictive value). As for weather forecasts which have no value for more than ca 10 days. I suspect them to be far to optimistic in this, when I look at the difficulties to measure scattering, absorption and emission from all the types of clouds, how clouds change over short periods, and to calculate feedbacks. I find it very encouraging to read that an influential modeler like Manabe thinks AOGCMs need “validating” and “improving” and has focused on the large and reproducible signals associated with the seasonal cycle when trying to do so. I find that much more enlightened that those who focus on one aspect of model and make predictions about what will happen when that aspect is improved. As for being “overly-optimistic”, I think that every scientist needs to be an optimist (and have a fairly sizable ego) to think that he can make a contribution that will solve an important problem (which earlier workers have often failed to solve). With luck, however, even failure to reach the ultimate goal will move us forward a little in some area. Unfortunately, policymakers need unambiguous answers and scientists can’t deliver them on a schedule. on April 29, 2017 at 4:22 pm | Reply Mike M.
Thanks for this comment, it is informative. It seems that Tan et al. have made a valuable contribution to basic science. Unfortunately, they have to contaminate it with meaningless speculation as to the effect on climate sensitivity. The Yale quote: “The work by Storelvmo’s group suggests that scientists may actually be close to designating the lower values in the currently accepted range as being unlikely” is just politics. The lower part of the IPCC range is based on observational data, not models, so there is no reason the new results should have any effect on that part of the range. No doubt the new results will cause some upward shift in model sensitivity. When it comes to feedbacks, the modellers know how to add but not how to subtract. So they will likely include this while continuing to ignore negative feedbacks like Lindzen’s Iris Effect. Mike M. The observations that I cited above should point to some negative feedbacks: What did CAM 5.1 model get out of these? “poleward retreat of mid-latitude storm tracks” should give higher consentrations of water wapor, ice particles and water droplets in higher altitudes toward the poles. “expansion of subtropical dry zones” should give some more subtropical IR radiation at TOA. “increasing height of the highest cloud tops at all latitudes” should give more supercooled droplets and ice particles all over. So an Iris Effect is real. Negative feedbacks are real. And I think they are rather underestimated than overestimated. on May 1, 2017 at 5:54 pm Mike M.
I think those are all positive feedbacks. Clouds cool by reflecting sunlight and warm by absorbing IR; more clouds at high latitude and less at low latitude means less cooling and just as much warming. Subtropical dry zones are net energy radiators. Variable area of these zones are the foundation of the Lindzen Iris Effect. on May 1, 2017 at 9:32 pm Mike M.
This map: https://earthobservatory.nasa.gov/Features/ACRIMSAT/acrimsat_3.php indicates that some dry zones (Sahara, Saudi Arabia) are modest net radiators and others (South Africa, Australia, SW U.S.) are modest net absorbers. It is not at all obvious that a poleward shift of dry areas would increase emission. The Iris effect is due to reduction of tropical cirrus clouds with warming, notwithstanding a figure that I have seen from the GWPF. You may be right. But I think the science is not settled yet. Two temperature dependent parameterizations of ice particle size distributions (PSD) were incorporated into NCAR’s Community Atmosphere Model (CAM3), along with corresponding ice mass sedimentation rates and radiative properties. The main difference between PSD schemes was the concentration of small (D < 60 µm) ice crystals. Higher small ice crystal concentrations resulted in lower ice fall speeds and greater cirrus IWP and coverage. This produced large changes in cloud forcing relative to the simulation with lower small crystal concentrations (PSD1), with a net cloud forcing in the tropics of -5 W m-2. Temperatures in the upper tropical troposphere were over 3 °C warmer relative to PSD1. The PSD schemes used here underestimate the observed uncertainty in small ice crystal concentrations from in situ measurements. As the cloud microphysics in GCMs becomes more realistic, these large uncertainties in small ice crystal concentrations may produce large uncertainties in surface warming in GCM CO2 doubling experiments. A greater focus on this problem appears warranted.